In February 2017, we undertook an expedition to Chad, central Africa, to search for this species which had no documented records for almost 40 years. 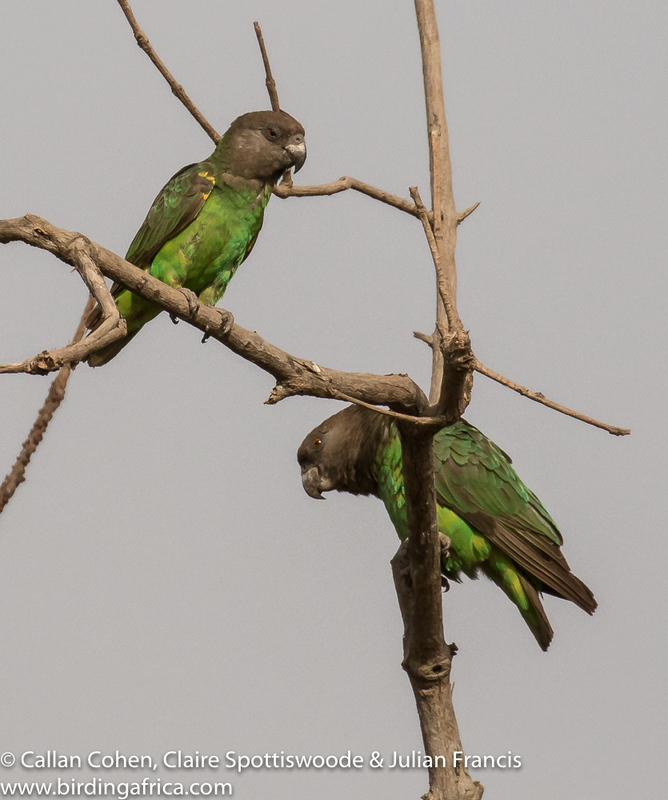 The Niam-niam is one of the world’s most poorly-known parrots, with little known of its conservation status, and was one of the last unphotographed birds in Africa until now. 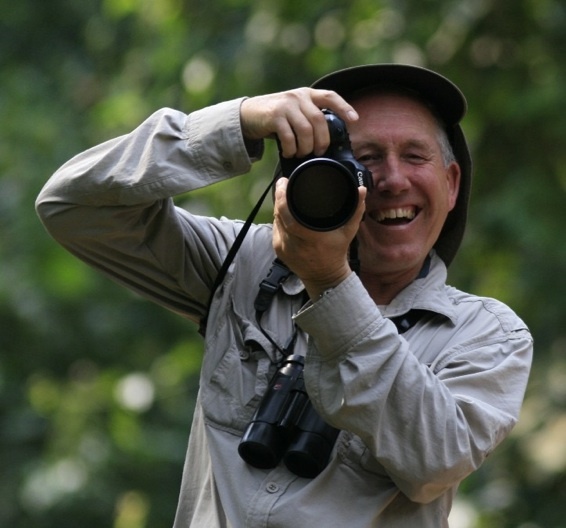 The survey was carried out jointly by the tour company Birding Africa and the FitzPatrick Institute of African Ornithology, both based in Cape Town. 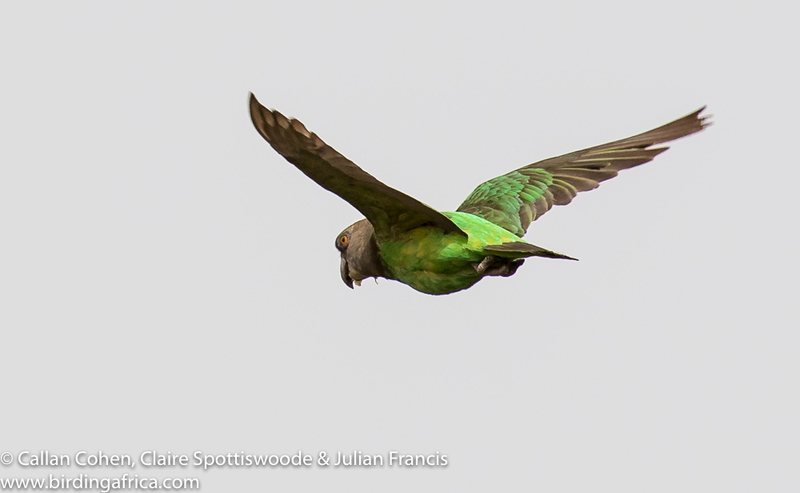 Based on discussions with colleagues at Birdlife International and the Word Parrot Trust, we have decided not to disclose the exact location as this species is not known in captivity could be threatened by unscrupulous collectors. We will be publishing our scientific and conservation findings shortly, but scroll down for more info in the photo captions. The first-ever photograph of Niam-niam Parrot. 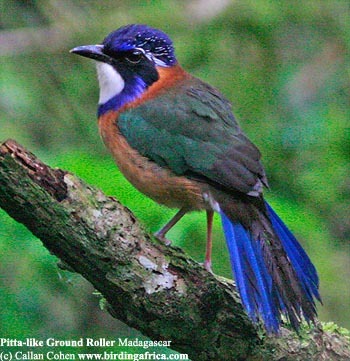 A shrill call while searching a remote area in central Africa drew our attention to this bird. 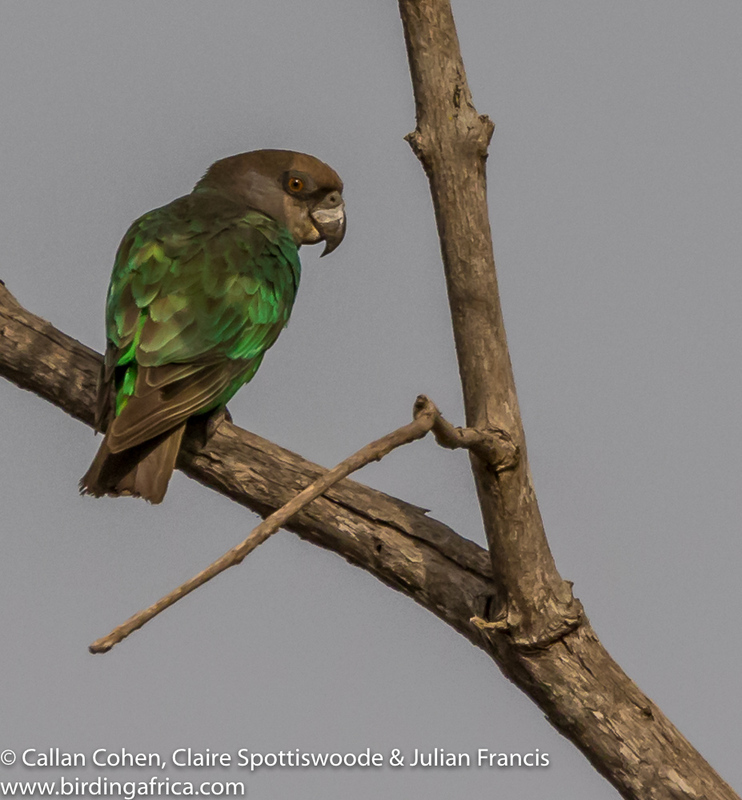 This chunky parrot is identified by its green belly and upperparts, grey-brown head and breast, green underwings, pale lower bill and orange eye. 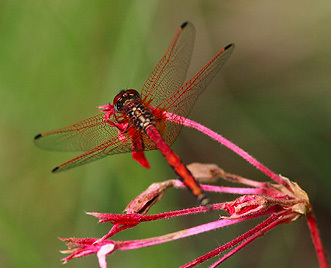 The lack of any yellow under the wings is distinctive. 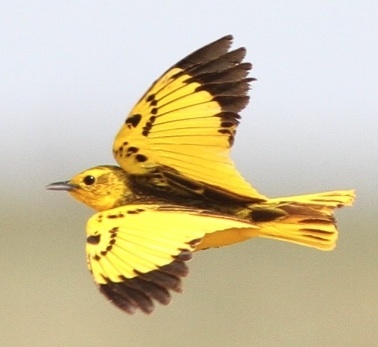 The only yellow in the plumage of Niam-niam is on some of the feather-bases to the body feathers, as also noted in museum specimens. 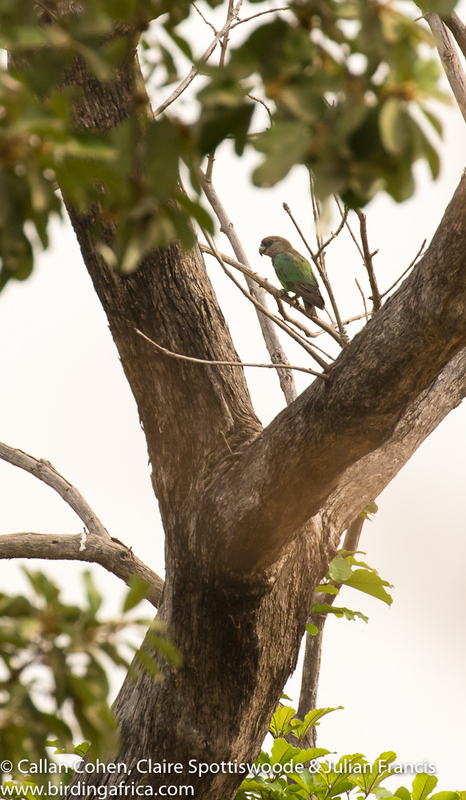 The differences from Meyer’s Parrot can be easily seen in this image: Meyer’s (top left) is smaller, has a deep red eye, yellow patches on the shoulder and under the wings, and a completely black bill. 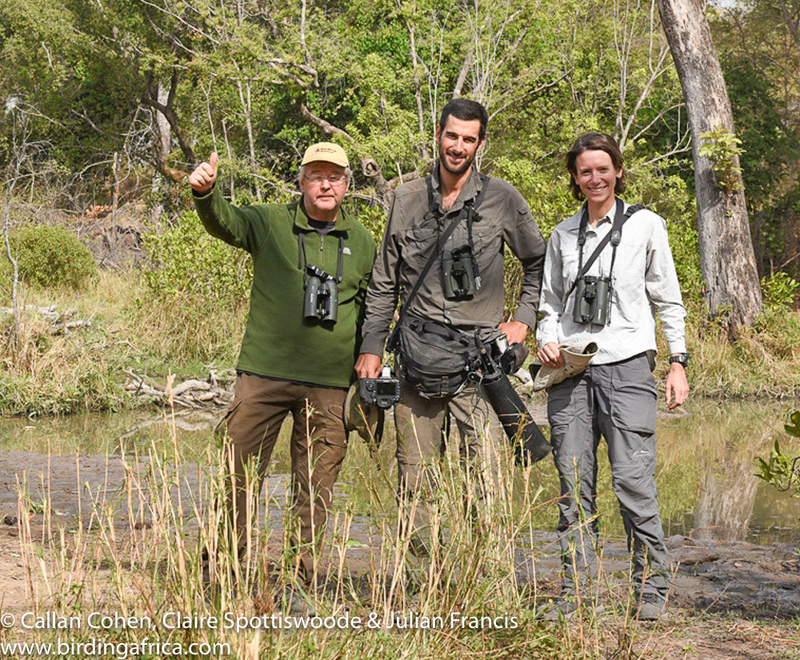 The Birding Africa – FitzPatrick Institute of African Ornithology expedition team consisted of (left to right) Julian Francis, Callan Cohen & Claire Spottiswoode (Michael Mills was a critical part of the planning but was unable to join). The area was sparsely inhabited but we’d like to thank those local community members that we did meet while searching in the area for their friendliness towards some eccentric visitors who must have seemed rather crazy! ← Ethan and Joe helping Arjan to break 6000!